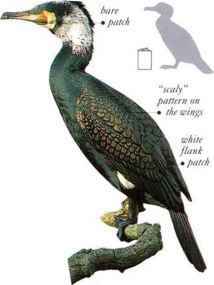 This slender, narrow-billed cormorant has a star pattern around the eye and fine, white spotting on its back and wings. When swimming, however, its wet plumage makes the bird look black, except for the white patch on its neck. It can be identified by its bright red legs, which show as juvenile it arches its body to plunge underwater. The species occurs entirely on coastal waters. Although not strongly social with its own kind, it joins other cormorant species and boobies in mixed flocks that fish and rest communally. It feeds on fish, squid, and crustaceans. Red-legged Cormorants breed in pairs or in small colonies, developing white, hairlike plumes among their head feathers when in breeding condition. 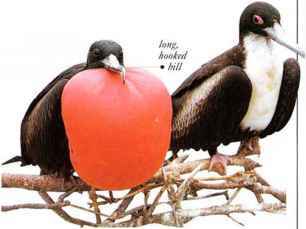 • NEST A low mound of seaweed, placed on a rock ledge. usually in the shelter of a sea cave. • DISTRIBUTION Coast and islands nof South America on Pacific side from Peru to S. C^hile, around southern tip fc. of South America to Atlantic coast of Argentina. A small head with a straight bill and a slender neck are sometimes all that can be seen of this bird as it swims with body submerged. 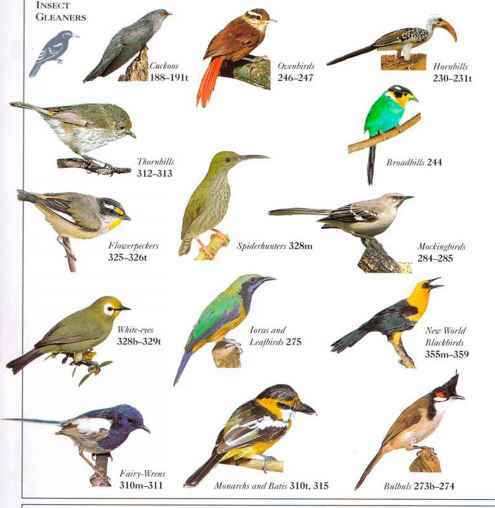 One of its other names, the Snakcbird. reflects this appearance. 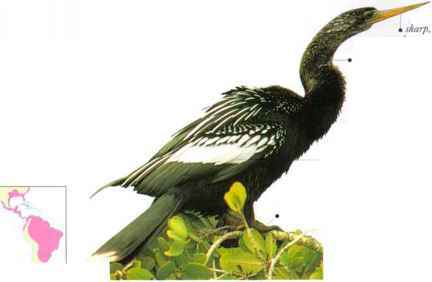 Resembling a cormorant, it differs in having a longer neck and in lacking a hooked bill. 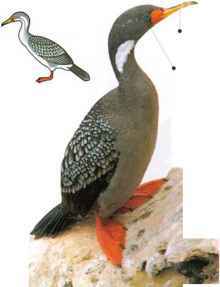 It inhabits freshwater swamps and catches fish underwater, spearing them on its bill, then taking them to the surface to be swallowed. Like cormorants, Anhingas spread their wings to dry their plumage. • DISTRIBUTION From S.E. USA to S. Brazil and N. Argentina.